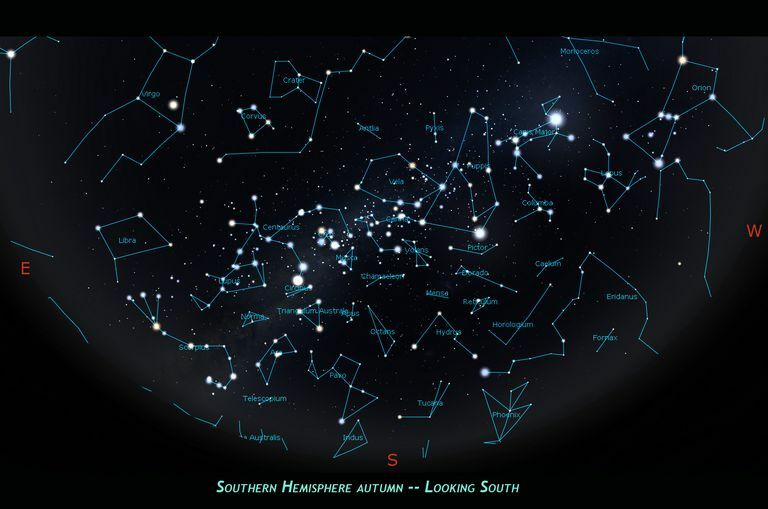 Southern hemisphere autumn constellations, looking south. The Phoenix constellation is a southern-hemisphere star pattern. Named after the mythical bird, Phoenix is part of a larger grouping of southern-hemisphere constellations referred to as the "Southern Birds." To locate Phoenix, look toward the southern region of the southern hemisphere sky. Phoenix is located between the constellations Eridanus (the River), Grus (the crane), and Horologium, the clock. Parts of the constellation are visible to northern hemisphere observers south of the 40th parallel, but the best view is reserved for those living well south of the equator. In China, this constellation was considered part of the nearby Sculptor star pattern and was viewed as a fish-catching net. In the Middle East, the constellation was called Al Rial and Al Zaurak, the latter of which means "the boat." This terminology makes sense, as the constellation is located nearby to Eridanus, the "river" constellation. In the 1600s, Johann Bayer named the constellation Phoenix and recorded it in his astronomical charts. The name came from the Dutch term "Den voghel Fenicx" or "The Bird Phoenix." French explorer and astronomer Nicolas de Lacaille also charted Phoenix and applied Bayer designations to the brightest stars in the pattern. The main part of Phoenix looks like a triangle and a lopsided quadrangle stuck together. The brightest star is called Ankaa, and its official designation is alpha Phoenicis (alpha indicates the brightness). The word "Ankaa" comes from Arabic and means Phoenix. This star is an orange giant located about 85 light-years away from the Sun. The second brightest star, beta Phoenicis, is actually a pair of yellow giant stars in orbit around a common center of gravity. Other stars in Phoenix form the shape of a boat's keel. The official constellation assigned by the International Astronomical Union contains many more stars, some of which appear to have planetary systems around them. Phoenix is also the radiant for a pair of meteor showers called the December Phoenicids and the July Phoenicids. The December shower occurs from November 29 until December 9; its meteors come from the tail of comet 289P/Blanpain. The July shower is very minor and occurs from July 3 to July 18 each year. Located in the "far south" position in the sky, Phoenix is far from the Milky Way's abundant star clusters and nebulae. Nevertheless, Phoenix is a galaxy hunter's delight, with numerous types of galaxies to explore. Amateur stargazers with a decent telescope will be able to view NGC 625, NGC 37, and a group of four called Robert's Quartet: NGC 87, NGC 88, NGC 89, and NGC 92. The quartet is a compact galaxy group about 160 million light-years away from us. Professional astronomers study these galaxies in an effort to understand how such giant associations of galaxies exist. The biggest one in the area is the Phoenix Cluster: 7.3 million light-years across and located 5.7 billion light-years away. Discovered as part of the South Pole Telescope collaboration, the Phoenix Cluster contains a highly active central galaxy that produces hundreds of new stars per year. Although it can't be seen with amateur telescopes, an even larger cluster exists in this region, too: El Gordo. El Gordo is comprised of two smaller galaxy clusters colliding with each other.